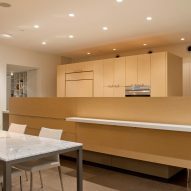 American studio Ibarraro Rosano Design Architects has elevated parts of this family dwelling off the parched ground in response to the client's request for no steps. The Levin Residence is located in Marana, a southern Arizona town with a history of farming and ranching. Stretched across a rugged desert site, the single-story dwelling features a detached garage, bocce court and pool terrace. The structure consists of concrete floor slabs and structural insulated panels clad in weathering steel and stucco. 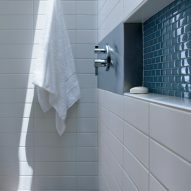 Creating a home with a strong connection to the outdoors was a primary concern for the design team. 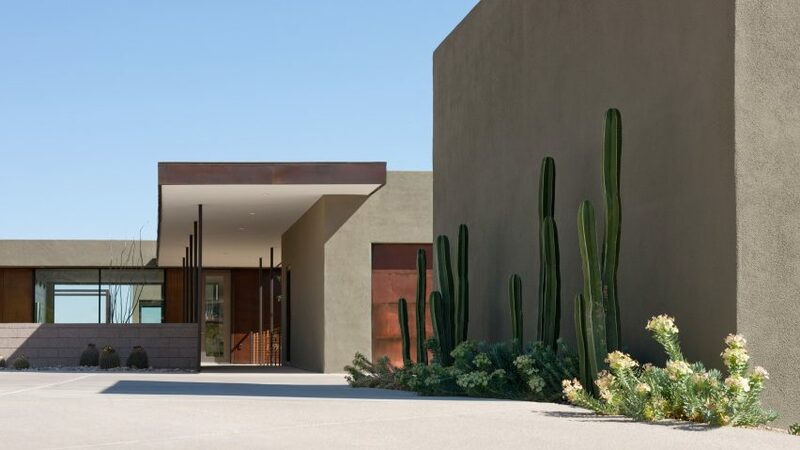 "The clients asked for a universally accessible home in which they could be fully immersed in the landscape, in constant engagement with the serenity and re-energising power of the Sonoran Desert and its sky," said Ibarraro Rosano Design Architects, a studio in the nearby city of Tucson. Because the client requested that the home contain no stairs, the floors remain level throughout. On sloped portions of the site, the studio cantilevered slabs over the landscape. The underside of the dwelling provides desert animals with "refuge from the harsh desert sun". "The careful integration of this home in its setting helps immerse the clients into their surroundings while respecting the land upon which it sits," the studio said. The dwelling is oriented to harness sunlight, capture breezes and frame views. It comprises three rectilinear volumes – two for the home and one for a garage – that serve as "distinct vignettes." Rather than perfectly line up the volumes, the team offset them in order to preserve views. "This horizontal shift creates protected and inviting intermediary exterior spaces while maintaining visual continuity across the site," the firm said. "In much the same way a photographer crops an image, the house organises the landscape into more intelligible formats to focus and celebrate the natural environment." Inside, the plan supports the idea of "collapsibility", in which homeowners use only a portion of the house when not accommodating guests. The primary volume – accessed via a covered bridge connected to the garage – contains the kitchen, dining area, living zone and master suite. 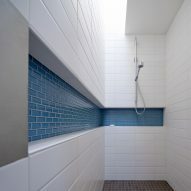 A slender bar links the main volume to the guest wing. The home wraps a courtyard with a pool, jacuzzi and outdoor fireplace. 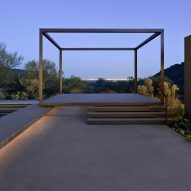 A concrete deck with a black metal frame floats over the landscape. The interior is fitted with contemporary decor, wooden cabinetry and bold artwork. 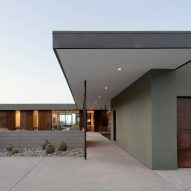 Other Arizona residential projects include a dwelling by DUST with rammed-earth walls made from volcanic residue and a home wrapped in a weathered steel shell by Wendell Burnette Architects.